Happy National "Don't Go to Work Unless It's Fun Day"! I planned a huge breakfast potluck at work today, and I'm stuffed. I don't think I'll eat for another week! Ha! Who am I kidding. I LOVED Madeline! I also loved begging my nieces to let us watch Madeline when I would babysit. Madeline, and Mary-Kate and Ashley are my go-to's. I remember (from pictures and from my mother) there was popcorn, and cotton candy, and cupcakes of course. My mom didn't just stop there. She had bales of hay lining the cul-de-sac, and we played musical chairs on them. My mom had hand drawn pink ponies on the invitations, and you better believe she still has a copy! When she sent me this picture, she said, "Marshmallow!" and I thought she was talkin about me. To ensure you, my mom wasn't calling me fat. The two ponies we had were named Marshmallow, and Caramel, and I was lucky enough to ride Marshmallow for my party! Isn't he just the cutest? Thankful for my moms memory! I hope to become a cool mom like my mom was, and plan awesome birthday parties every.single.year. Thanks momma! -I hope this makes you laugh. -If you want to read about our "love story" I finally took time to write it down here. -Regardless of your faith, I invite you to watch LDS General Conference with me this weekend! I promise you will find it uplifting, and it will make you HAPPY! Please feel free to contact me if you have any questions. A. I love Madeline. 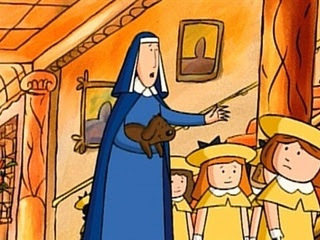 Fun fact, Miss Clavel isn't a nun, she's a nurse. Thank you, NPR. (crazy, right?! I had no idea). B. The not washing your hair thing.. I got your back, I have the same problem. I'm now the queen of 20 minutes up an our the door routine. C. I want your job. That's all. Love this. Love you.